Our hands are so different. My mothers and mine. Hers are broad and strong and mine are slim and long. I have always loved my mother’s hands. Growing up, I was mesmerized watching her. The way she held her coffee cup, always with both hands. The way she buttered her toast. She always made sitting at the breakfast table look so glamorous. She still does. Normally, she was running around, never sitting still. But at the breakfast table she was always peaceful and still and beautiful. I always imagined myself doing that. I’m not sure why. But it seemed like what being grown up was going to be like. Quietly enjoying breakfast and holding a coffee cup with both hands. I don’t remember her knitting when I was little. I remember that later after she retired, but I loved to watch her knit. 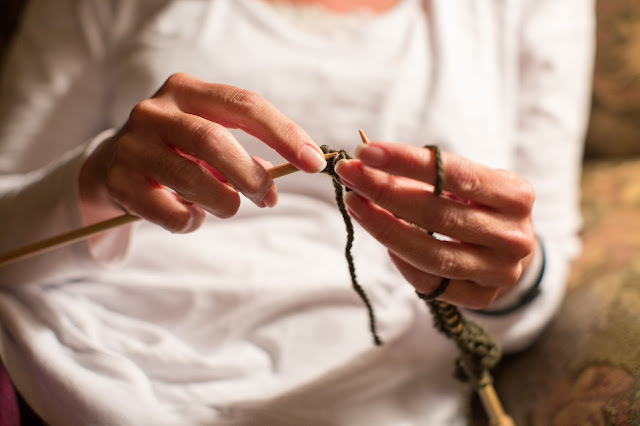 The stitches flew off the needles and her hands moved with such grace. Broad and strong grace. I had always wanted to learn but never did. When I did decide to learn it came at a time when my mother and I didn’t seem to see eye to eye on much. We are so different. She, so strong and capable and political and smart. So worried about the world. Me, living my life in a daydream. Reading and pretending. Living in fear of anyone arguing, let alone the state of the world. We were visiting her in Torrey, Utah, where they live. The middle of nowhere. I wanted to learn to knit but, I also wanted to connect with her. I asked her to teach me. I knew it was important that she was the one who taught me. In my romantic inner self, I wanted to say I learned from my mum. I had visions of teaching my daughters and granddaughters and being able to say that. And them saying it also. But when she sat down to teach me, it seemed backwards. Like trying to learn while looking in the mirror. Her hands flew. Mine didn’t. I watched and watched but it felt so awkward. I managed to knit a bit but after a frustrating hour or two, I put the needles down and looked for aspirin. Knitting seemed really hard. When we left, she sent me home with needles and a little yarn in a “project bag”. I was not sure I could do it. Or that I would even try. But a few days after we got home I pulled out the needles and tried to remember what she taught me. I pictured her hands flying and flying and flying. I tried to mimic her, just like I did when I was little. The coffee cup, the toast, the grace. After a while, what resembled a scarf started to take shape. I didn’t have enough yarn for a real scarf, but I didn’t want to stop so I just changed color. And changed color again. My hands started to fly a little. The next time I saw my mother, I showed her my multi colored scarf and my awkward attempts at other things. There was a little pride. 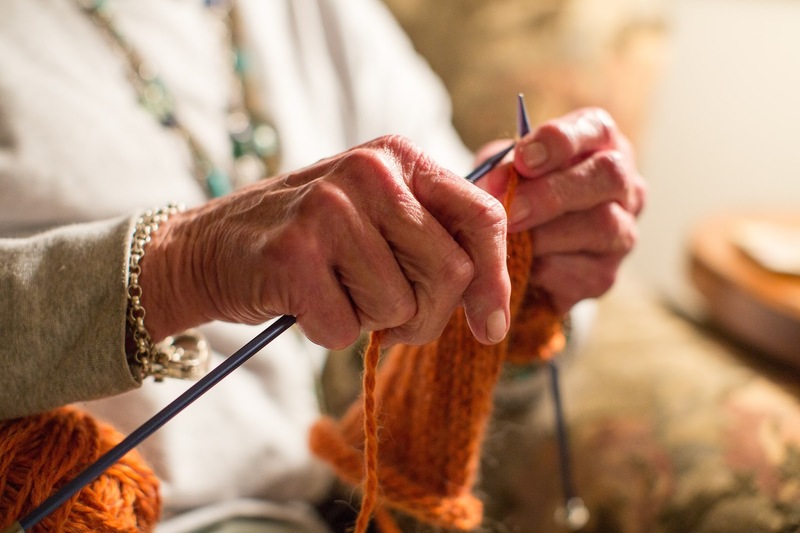 When we sat down to knit together, we noticed the most amazing thing. I knit completely opposite of the way she did. Like I was looking in a mirror…. At some point we come the realization that life is not made up of big grand moments but of simple things. Sometimes it takes years to discover happiness. Usually with much anguish along the way. But the destination is never as important as it seems. It’s the journey. And it doesn’t require pictures or documentation. Just love. My mum taught me to knit. And to hold my teacup with both hands. Hands that are completely different than hers. Good job, Staci. We should write volumes about her. I love this!! So beautiful!! !